Do you have a mudroom? Of course it would be great if each home had one. This is especially true in a large family home. It is especially true in the winter, with the pile-up of coats, boots, hats, mittens, scarves, school backpacks, lunch boxes etc. Alas, my home does not have one. Our back (family) room is huge but there’s no transition from the outside to the inside. So of course I had to make one. I decided to use the 5-Cube Expedit bookcase from Ikea for the bottom portion of my ‘Mudroom’ Storage. Next to the Billy, Expedit is my other favorite bookshelf design by Ikea. I knew I had to have it when I saw how my Brother-In-law used his 20-cuber to hold his insane vinyl record collection. It is spacious, yet sleek, modern, yet functional. My Expedit has been relocated to practically every room in my house. I originally bought it for my boys’ room, but it didn’t last long there. Turned out they didn’t really need a bench-style bookshelf. And it was too small to hold their book collection anyway. I tried to put it in my bathroom closet, only to find out that it was about 1/16” too wide to fit in the oddly shaped narrow closet. I used it to hold my Screen-printing Supplies in my work area, but stuff kept falling out of the back. The most logical space for it has been in the back family room. So far so good. In its current incarnation, mine serves as a sort of transition to the outside in the back entrance of our home. 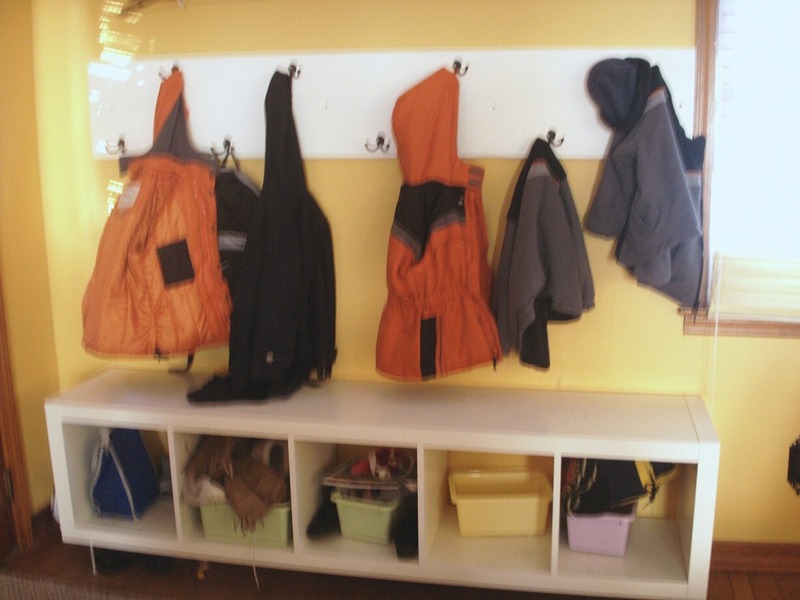 It is coupled with a piece of painted lumber roughly the same width, that I painted and outfitted with hooks to hang coats. My mini-Expedit with it’s neat design of 6 cubbies, holds shoes, boots, bins and other winter-dressing paraphernalia. It has helped to define a once-indefinable area and provided a badly needed solution. How about you? 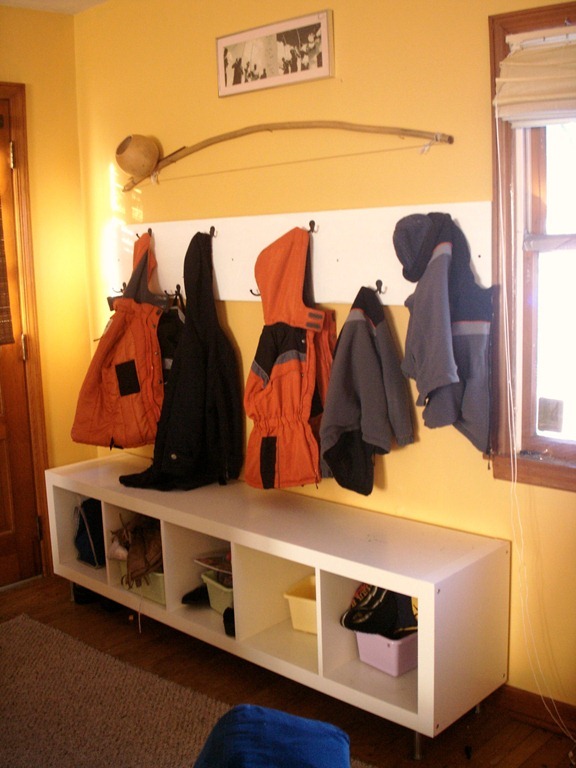 Do you have a clever way of using the Expedit or arranging your Mudroom? Drop a line below! Below is a slideshow of Expedit or similar bookshelf design and how others have used it. I love your makeshift mudroom. Genius! No real need for one here, but I have other DIY projects lurking around in my mind. I’ll be sure to post as they take form in my home. thanks for stopping by and for the link! Love her pictures! One day… she’s in Ohio too, cool…I’ll have to RSS her. I live in a loft apartment, so I don’t have a mudroom, but I have always loved them. You have done a great job with yours! I’m so glad you found a tip to use. I can’t wait to see it when it’s done.